Evaluation of cytotoxic effects of Anbarnesa on fibroblast L929: Can it be used as a mouthwash? Aims: In Iranian traditional medicine Anbarnesa (derived from smoke from burning female donkey's stool) has been used to treat ulcers and inflammatory conditions like stomatitis and ear infections (otitis). We assess the properties of Anbarnesa as an alternative mouthwash. Materials and Methods: In this experimental study, Anbarnesa smoke was analyzed using aGC-mass device. The smoke collected was dissolved at different densities in propylene glycol and incubated in Dulbecco's modified Eagle's medium in direct contact with fibroblast cells. Assessment of cytotoxicity was done at 1, 24 and 72 h. Cell viability was measured by methyl thiazolyl tetrazolium test, and ELISA Reader machine was used to read the results. Data were analyzed using one-way ANOVA test. Results: The findings of this study showed Anbarnesa was nontoxic in 1/64, 1/128 and 1/256 dilutions. In 1/32 dilution, toxicity was seen after 72 h. In dilutions, 1/8 and 1/16 toxicity were seen in the 1 st h.
Conclusion: According to the initial results of Anbarnesa may be used as an alternative mouthwash with fewer side-effects for plaque control and prevention of periodontal disease. Fibroblast cells are dominant cells in periodontal ligament (PDL), and are important in maintaining healthy gingiva and surrounding tissues. , The biological effects of the mouth rinses have not been sufficiently studied; the present work was done to determine the cytotoxic effect of Anbarnesa sebum 1 on cultured mice fibroblasts in category L929. In this experimental in vitro study, 198 samples with positive and negative controls of mice fibroblast cells obtained from the Pasteur Institute cell bank (Tehran, Iran) were studied. According to the standard ISO 10993:5, 6 replicates were used. The original concentrations, 1/2, 1/4, 1/8, 1/16, 1/32, 1/64, 1/128, 1/256 dilution were prepared and studied. Assessments were done after 1 h, 24 and 72 h after contact with the cells. First, Anbarnesa smoke was analyzed using aGC-mass device and substances such as hexane, citric acid and dimethylamine were reported. After ensuring the effectiveness of materials, Anbarnesa was burned inside a closed container with its walls coated with propylene glycol. After cooling the environment, substances in the smoke adhered to the walls. This was repeated several times to accumulate enough smoke residue on the walls. Then 10 mL propylene glycol solution was added to the container and mixed well with the material on the walls. Next, the contents were transferred to a falcon tube to separate impurities, and the suspended samples were centrifuged for 30 min. Using a Pasteur pipette, the supernatant fluid was transferred to another tube. This solution was named Anbarnesa sbmu 1. The concentration of the liquid was measured using liquid chromatography and diluted to concentrations of 0.2% and minimum inhibitory concentration values were evaluated against different bacterial species and compared with control samples of propylene glycol. Growth inhibitions on species of Streptococcus mutans, Streptococcus salivarious, Streptococcus sanguinis, and Streptococcus pyogenes after the exposure to this solution were assessed for antibacterial properties. Complete Dulbecco's modified Eagle's medium (DMEM) with embryonic bovine serum was used for the culture. After distribution of cells in wells of three plates, the plates were incubated for 24 h. After this, the culture medium was removed from wells and then 200 μl of sample (prepared by dilution) was placed in each of the wells. In each plate, 6 wells of negative controls and 6 wells of positive controls were assigned. The sample plates were incubated at temperatures 37°Cat 98% humidity and 5% CO 2 . The methyl thiazolyl tetrazolium (MTT) test was used to assess cytotoxicity based on color change and the production of formazan. For the MTT test, tetrazolium bromide salt (Sigma-Aldrich, USA) at a ratio of 5 mg/mL in phosphate buffer solution was mixed with the DMEM at ratio of 1/10. ELISA reader machine (Anthoos, 2020, Australia) was used to read the optical density (OD). Data of OD were divided to OD of negative controls to assess cell viability. The data were statistically analyzed using computer SPSS 17 software (IBM Chicago, IL) and one-way ANOVA test. Mean and standard deviation of OD sat different concentrations at 1 h are presented in [Table 1]. 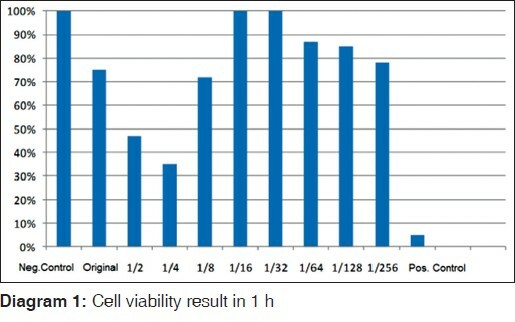 For measuring the cell viability, OD at different concentrations are divided to ODs of negative controls shown in Diagram 1. 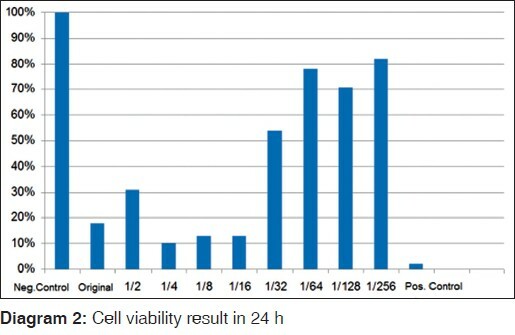 Cell viability over 70% meant that the concentration was not cytotoxic to fibroblast cells. Cell survival between 50% and 70% meant that the concentration had a cytotoxic effect on half of the fibroblast cells. And cell survival below 50% meant that the concentration is cytotoxic to fibroblast cells. Means and standard deviations of OD sat different dilutions at 24 and 72 h are presented in [Table 2] and [Table 3], respectively. 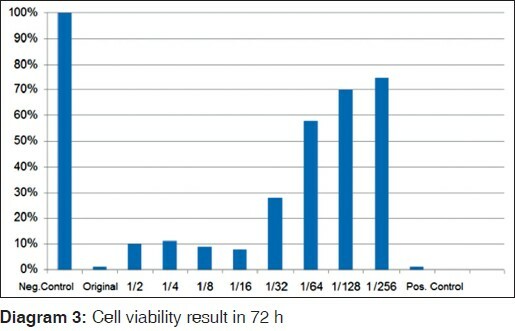 Furthermore, cell viability at 24 and 72 h is shown in Diagrams 2 and 3 respectively. There was no toxicity at dilutions of 1/32, 1/64, 1/128 and 1/256. The ANOVA test was used to compare toxicity and significant difference were reported in these four concentrations (P < 0.05). The data in this study showed no toxicity at the 1/64, 1/128 and 1/256 dilutions. At 1/32 dilution, toxicity was seen only after 72 h and in dilutions 1/8 and 1/16 toxicity was not observed in the 1 st h.
Dilutions 1/2 and 1/4 however were cytotoxic. According to the results decreasing dilution, reduces toxicity. Given that satisfactory results of the Anbarnesa sbmu 1 solution that had no cytotoxicity at 1/64 dilution, it may be used as an alternative solution for plaque control with less common side-effects. This article was based on undergraduate thesis by Dr. Mina which was successfully completed under the supervision of Dr. Shafiee and Dr. Joharchi, with the close cooperation of the oral medicine Department of Dental School of Shahid Beheshti University of Medical Sciences. Newman MG, Takei HH, Carranza FA. Carranza's Clinical Periodontology. 10 th ed., Ch. 1, 2, 26, 38, 49. Chicago, IL W.B. Saunders Co.; 2006. Niederman R, Abdelshehid G, Goodson JM. Periodontal therapy using local delivery of antimicrobial agents. Dent Clin North Am 2002;46:665-77, viii. Baldo BA, Pham NH, Zhao Z. Chemistry of drug allergenicity. Curr Opin Allergy Clin Immunol 2001;1:327-35. Moshrefi A. Chlorhexidine. J West Soc Periodontol Periodontal Abstr 2002;50:5-9. Overholser CD, Meiller TF, DePaola LG, Minah GE, Niehaus C. Comparative effects of 2 chemotherapeutic mouthrinses on the development of supragingival dental plaque and gingivitis. J Clin Periodontol 1990;17:575-9. Wilken R, Botha SJ, Grobler A, Germishuys PJ. In vitro cytotoxicity of chlorhexidine gluconate, benzydamine-HCl and povidone iodine mouthrinses on human gingival fibroblasts. SADJ 2001;56:455-60. Ostad SN, Gard PR. Cytotoxicity and teratogenicity of chlorhexidine diacetate released from hollow nylon fibres. J Pharm Pharmacol 2000;52:779-84. Hidalgo E, Dominguez C. Mechanisms underlying chlorhexidine-induced cytotoxicity. Toxicol In Vitro 2001;15:271-6. Cury JA, Rocha EP, Koo H, Francisco SB, Del Bel Cury AA. Effect of saccharin on antibacterial activity of chlorhexidine gel. Braz Dent J 2000;11:29-34. Mandel ID. Antimicrobial mouthrinses: Overview and update. J Am Dent Assoc 1994;125 Suppl 2:2S-10. Fabricant DS, Farnsworth NR. The value of plants used in traditional medicine for drug discovery. Environ Health Perspect 2001;109 Suppl 1:69-75. Shafiee HA, Mortazavi H, Baharvand M, Eslami G, Bakhtiari S, Taheri S, et al. Iranian traditional medicine: Comparison of the antibacterial effect of ANNAS 0.2% and chlorhexidine. Am J Ment Retard 2012;6:3600-3. Moral R, Moreno-Caselles J, Perez-Murcia MD, Perez-Espinosa A, Rufete B, Paredes C. Characterisation of the organic matter pool in manures. Bioresour Technol 2005;96:153-8. Mohagheghzadeh A, Faridi P, Shams-Ardakani M, Ghasemi Y. Medicinal smokes. J Ethnopharmacol 2006;108:161-84. Poggi P, Rodrignez Y, Bena R, Rizzo S, Rota MT. Month rinses with alcohol: Cytotioxic effects on human gingival fibroblasts in vitro. J Periodontal 2007;75:623-9. Huang FM, Tai KW, Chou MY, Chang YC. Cytotoxicity of resin-, zinc oxide-eugenol-, and calcium hydroxide-based root canal sealers on human periodontal ligament cells and permanent V79 cells. Int Endod J 2002;35:153-8. Schweikl H, Schmalz G. Toxicity parameters for cytotoxicity testing of dental materials in two different mammalian cell lines. Eur J Oral Sci 1996;104:292-9. Keiser K, Johnson CC, Tipton DA. Cytotoxicity of mineral trioxide aggregate using human periodontal ligament fibroblasts. J Endod 2000;26:288-91. Sanchez IR, Nusbaum KE, Swaim SF, Hale AS, Henderson RA, McGuire JA. Chlorhexidine diacetate and povidone-iodine cytotoxicity to canine embryonic fibroblasts and Staphylococcus aureus. Vet Surg 1988;17:182-5. Damour O, Hua SZ, Lasne F, Villain M, Rousselle P, Collombel C. Cytotoxicity evaluation of antiseptics and antibiotics on cultured human fibroblasts and keratinocytes. Burns 1992;18:479-85. Fabreguette A, Zhi Hua S, Lasne F, Damour O. Evaluation of the cytotoxicity of antiseptics used in current practice on cultures of fibroblasts and keratinocytes. Pathol Biol (Paris) 1994;42:888-92. Boyce ST, Warden GD, Holder IA. Cytotoxicity testing of topical antimicrobial agents on human keratinocytes and fibroblasts for cultured skin grafts. J Burn Care Rehabil 1995;16:97-103. Chang YC, Huang FM, Tai KW, Chou MY. The effect of sodium hypochlorite and chlorhexidine on cultured human periodontal ligament cells. Oral Surg Oral Med Oral Pathol Oral Radiol Endod 2001;92:446-50.